Have you ever wanted to learn how to make jewellery? Why don’t you do something for yourself, start a hobby in 2016 and gain new skills? Learn new skills, have some fun and take part in a jewellery class with me, Genna Delaney, in my studio at WASPS Studios, Dundee. I have been designing and making jewellery since 1999 when I began my studies at Cardonald College, near Glasgow. Then after finishing with an NC and HND Jewellery and Silversmithing with 4 merits and a few awards, I got into Duncan of Jordanstone College of Art in Dundee. I graduated with BDes(HONS) Jewellery and Metal Design in 2006 and set up my business in October that year. I have been making jewellery professionally for over 9 years and have won more awards along the way. Designing and making jewellery is my passion. I’ve always wanted to pass on my skills by teaching people and feel it’s time to offer bespoke jewellery making classes. I’m offering different types of classes for individuals, couples and small groups of 4 people. The classes will start in January 2016. Ring making Class – You will learn how to saw, file, texture, hammer, anneal, solder and polish. 3-4hr class. Make your own engagement rings – would you like to design and make your own engagement ring for yourself or your partner or both of you? 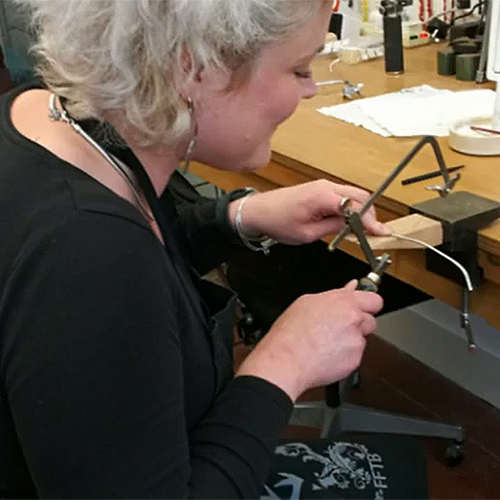 One Day (5 hrs) Bespoke jewellery classes – Is there a specific technique you would like to learn? What piece of jewellery would you like to make? A ring, necklace, bracelet, special gift for your loved one? £300 per day. Hen Party Jewellery Classes – learn with your friends. I currently can only fit 5 people, with 4 people soldering at the same time. Contact me for prices and more info. Do you know someone who would like to learn how to make jewellery? Not sure what to get your loved one for Christmas? Then treat them to a special bespoke jewellery class! What would you like to learn? Get in touch to book your class for 2016.